My first encounter with Emman Usman Shehu in the 1980s was at The Anthill--a poetry and music joint just outside the University of Nigeria, Nsukka that in its time featured blistering poetry readings by Olu Oguibe, Esiaba Irobi, Uche Nduka, Tunde Fatunde among others. Shehu not only read some of his own work at The Anthill but co-compered the readings/performances with Mike Adiele and Gbugbemi Amas. 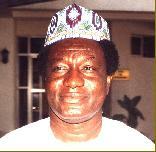 The author of Questions For Big Brother, Shehu's new book of poetry "Open Sesame" is slated for publication in 2004. Here is my electronic conversation with him. Nnorom Azuonye (NA): Let's begin this chat with a quick note on your place and time of birth. Emman Usman Shehu (EUS): I was born in Kaduna, Nigeria, during its period as the capital of the old Northern Region. As a civil servant my father was based in Kaduna, though paternally we hail from Maradun, present day Zamfara State. In those days it used to be part of Sokoto Province. NA: Have you had creative writing training or are you one of those 'born writers'? EUS: I did not have any formal creative writing training until after the Master of Arts degree in African Literature. I was working with the Nigerian Television Authority (NTA), Sokoto and was looking to starting a career in television/film production. I saw an advertisement in West Africa magazine for a screenwriting course in London. I applied and fortunately got an NTA sponsorship. As recently as 2001, I got involved in a British Council screenwriting workshop. However I have taken the pains to teach myself various aspects of creative writing through relevant books, magazines and articles. And teaching Creative Writing at Usmanu Dan Fodio University, Sokoto was a rewarding experience, as various strategies of writing became more meaningful to me. NA: How have the circumstances of your birth and your education come together to shape your artistic thrust? EUS: Inevitably the circumstances of my birth and education have impacted on my artistic thrust. I got exposed to the world of literature and music at quite an early age. My parents had a passion for acquiring books and magazines. So it was natural that from the moment I could figure out things on a page, I also got bitten by the bug. Our parents even encouraged us to patronise the regional library in Kaduna, and I was then in primary three. So too the library at what was then St Peter's College, Kawo, Kaduna, where my mother was a tutor. There was also a lot of music around the house - on radio and the records my father purchased. My parents were keen on singing and playing musical instruments but did not have the time to take their interest in music to a higher level. I was fortunate that my parents encouraged me when they noticed my flair for writing. So the early poems, short stories and plays were typed through the assistance of my parents. And they encouraged my early dabbling into journalism. I deliberately chose to study literature at the University level because I felt it would help me become a better writer, since there were no creative writing courses as such.